Cleaning gutters can be a dangerous chore, so let a 21st century robot do it for you safely. The cool new iRobot Looj 330 is a high tech gutter cleaning robot that blasts away leaves, dirt, and clogs while brushing gutters clean. You'll still need to climb a ladder to place the Looj in the gutter, but once in place, just detach the handle that doubles as a remote control and press the simple one button CLEAN mode (manual mode included if needed). 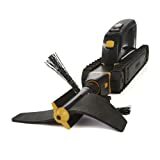 The Looj will propel itself down the length of the gutter, under the brackets and straps, and over the downspout holes dislodging and removing all gutter debris using a high velocity, four-stage auger. It cleans a 30-foot section of gutter in 5 minutes, up to 200 linear feet per charge, and attaches to an included belt clip, so your hands are free to climb the ladder. More robots please!